Energizer is a consumer goods company that supplies the personal care products globally. It currently supplies portable power lighting products, wet shave, personal grooming, skin care products, infant care etc. It enhances the beauty of a person through its products and millions of people today are using these products to improve their looks. The company has established more than 30 brands all over the world that include Banana Boat, Schick, Wilkinson Sword etc. Its operations are carried over in more than 50 countries and distributed to over more than 160 countries. Their products are considered to be impressive to customers and in many ways people lives better through their products. 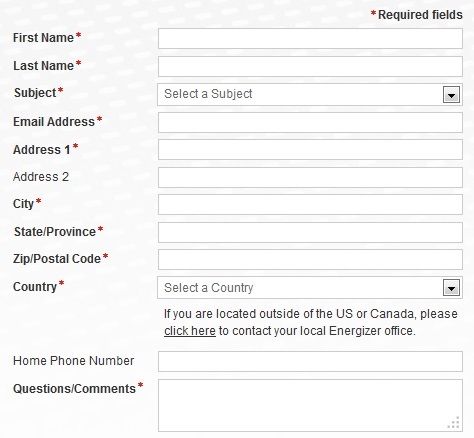 For any enquiries about the company products or for suggestions, customers can use Contact From and the snapshot of the form is shown below for reference. For more details about the company and its products, customers can refer the company Website .